Stage diving comes with risks. Some musicians were reported to be injured in their act. Not to mention some incidents of fans got injured too in the act of stage diving. Even brings many risks, this kind of fashion is still be done as a final attraction of a music concert or crowd-involving occasion. 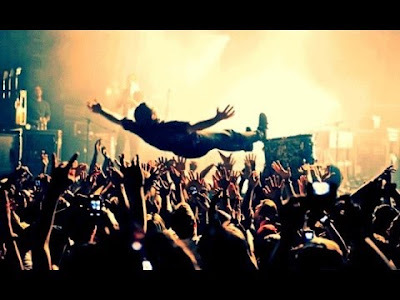 Despite of the danger for both musicians and their fans, stage diving becomes popular iconic acts for many musicians and printed in T-shirts and more media. Maybe some people think this activity like ugly but this It's almost time for the Fashion Meets Music. Lets do it and expression this session.